Is your home being overrun by unpleasant odors? Whether you own a pet, frequently cook or live with a smoker, Protect Plus Industries' The Web Filter Fresh Whole Home Ocean Mist Air Freshener is all you need to keep your entire home smelling great for days. The secret to the Filter Fresh pads' effectiveness lies in an odor counteractant that works with fragrance to combat your home's most unpleasant odors. Coming in a fresh, clean scent of ocean mist, this air freshener perfectly accommodates an apartment, home or office, filling the entire space with a special odor-fighting formula. Have small areas that could use a little refresher? The Filter Fresh air freshener can handle that too, eliminating odors in closets, bathrooms and even your car. 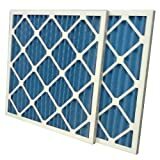 And it couldn't be easier to use: Simply attach the Filter Fresh pads to any size filter on a central furnace or AC unit. It will even work on electrostatic filters, but don't use the pads on these types of filters if it is directly connected to your household's electrical currents. Have an oscillating fan? Then you can connect Filter Fresh to the front of it, allowing you to pleasantly scent one room at a time. 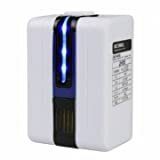 For days of cool ocean mist to revive your stale office, apartment or closet, use Protect Plus Industries' The Web Filter Fresh Whole Home Ocean Mist Air Freshener. Actual Size: 13-1/2" x 13-1/2" x 3/4"
Actual Size: 11-3/4" x 11-3/4" x 3/4"
Mini small Air cleaner, Focused on indoor air purification, make your living environment just like being in the forest, natural and comfortable 🙂 Super silent running mode, high quality of anion generator. Knob switch, energy conservation and emissions reduction, circular tuyere grid, easy to use and environmental friendly. It has 7 purafication effects : Prevent electrical radiation; Prevent pollen allergy; Removal of formaldehyde and toluene; Improve sleep quality; Remove the peculiar smell smoke; Increase the oxygen content; Prevent respiratory tract disease. Warm tips : 1. 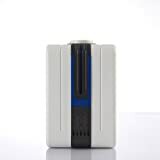 The air purifier will release a lot of negative ions, which is a colorless, odorless gas, so you can't feel smell even using for hours. If someone is smoking in the home, the secondhand smoke decreased significantly after using the machine. 2. Negative ions has strong absorption to pollutants, like dust in the air and second-hand smoke. So after using for a long time, dust and other things will be gathering around the purifier. Use towels with little alcohol to clean the machine shell and wall, they would be bright as new.